Recipe adapted from this recipe for beef stew. 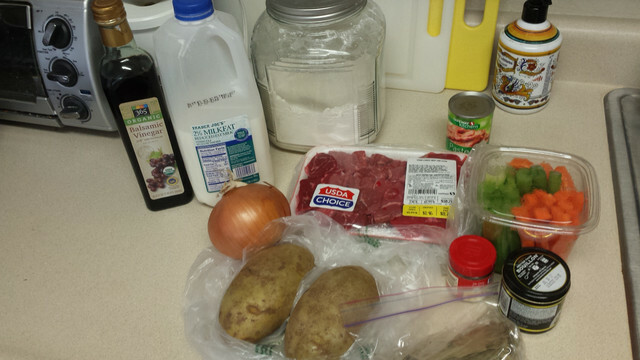 DISCLAIMER: There are many ways you can make beef stew! 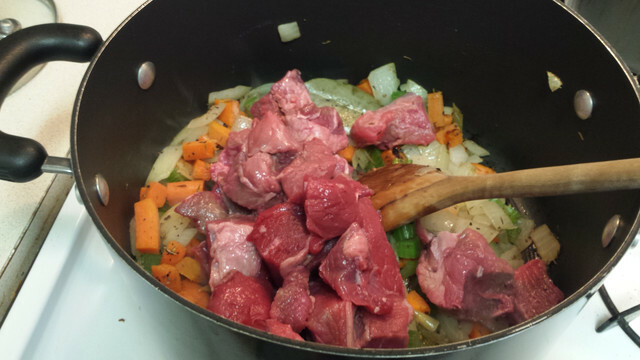 A few people have mentioned that browning the meat beforehand will produce a better stew. The great thing about this recipe is that there is not a specific recipe to follow from the manga or anime. You can do whatever you want, as long as it tastes good to you! I thought this tasted amazing, and my friends agreed, but you can really do whatever you want. That’s the great thing about cooking at home- you can adapt recipes as much as you want to suit your preferences. 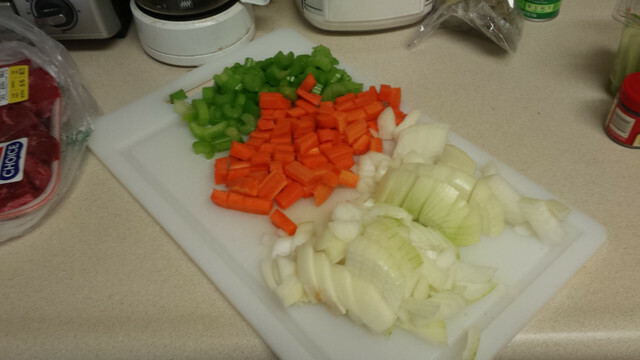 Start by chopping your celery, onion, and carrots to bite sized pieces. In a large pot, heat some oil or butter over medium high heat. 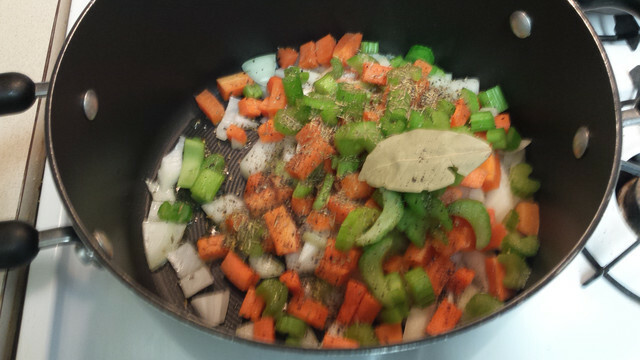 When melty and the pot is warm, saute onions, carrot, and celery with bay leaf, thyme, salt, and pepper for about 10 minutes, until onion is soft. 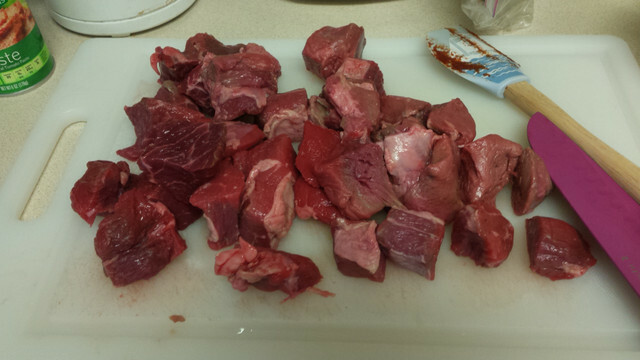 While that’s softening, take out stew meat and cut down any larger chunks so they’re more bite-sized. 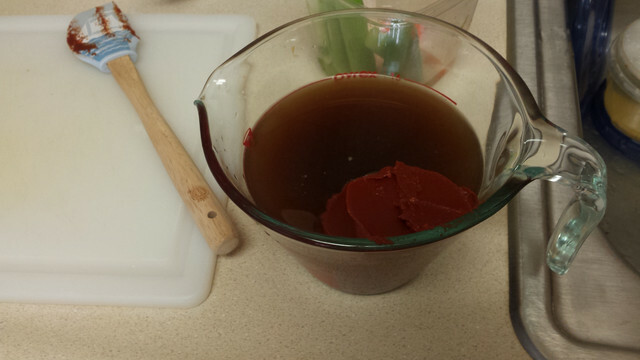 In a measuring cup, measure out your beef broth, water, and buillion. Add vinegar to this broth. Open tomato paste and measure out. Set aside. 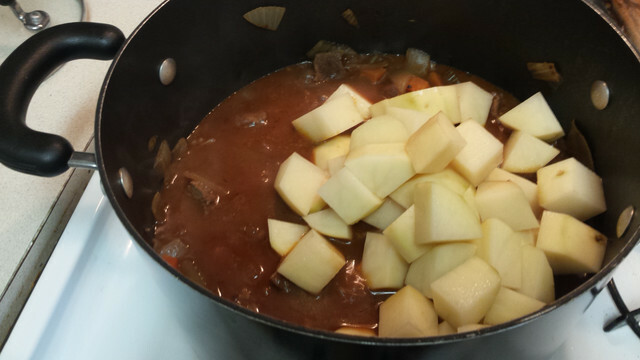 When onion is soft, dump beef into the pot and toss around until all pieces are separated and slightly browned. Season again with salt and pepper. Pour in your beef broth and vinegar mixture, as well as the tomato paste. Mix together until tomato paste is dissolved into the broth. Cover with a lid, and reduce heat to low. Stir on and off for the next 45 minutes. While you wait, tidy up and prepare the milk. 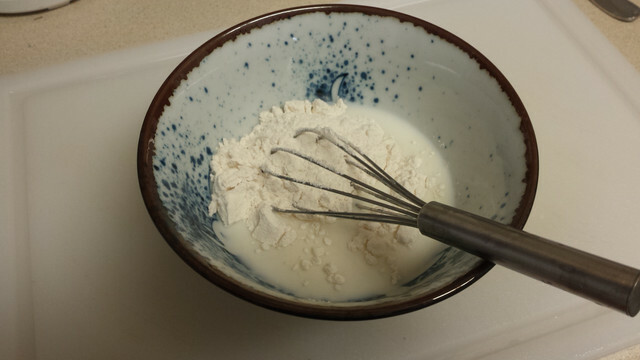 Whisk 1/4 cup milk with the flour and set aside. Don’t whisk the flour into all the milk- you’ll get lumps and the milk might sieze when you pour it all into the hot stew. 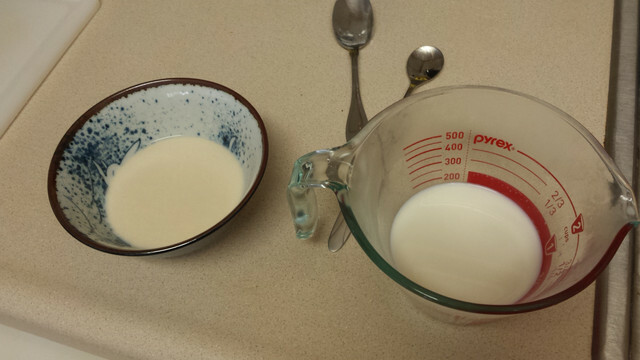 Measure out the rest of the milk and set aside. 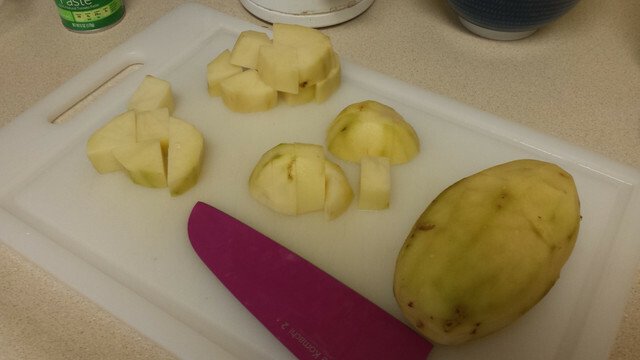 Peel and chop the potatoes into 1 inch pieces, and set aside. 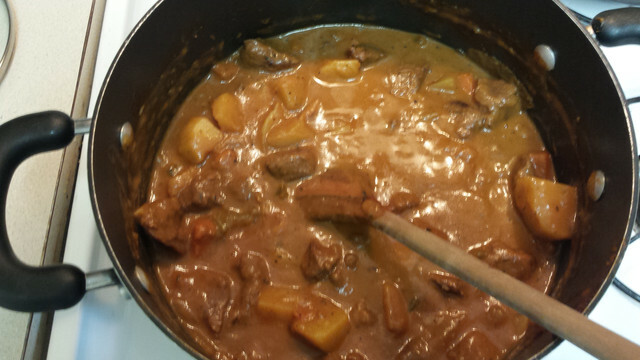 When the stew is ready- beef is starting to get tender- raise the heat and add in the potatoes. Quickly microwave the larger portion of milk so that it’s steaming- it’s important that you do this so that when you add it to the stew, the milk doesn’t curdle due to the heat differences. This took me about 45 seconds in the microwave. 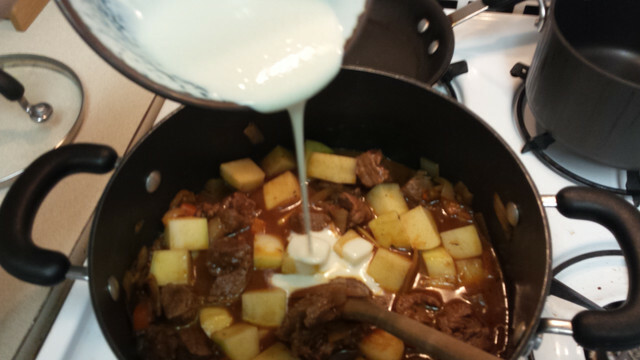 Add in the milk/flour mixture to the stew, and stir through. Then, add in the milk and stir everything to combine. Lower heat to low, and allow to simmer, uncovered, for another 45 minutes to 1 hour, or until potatoes are softened. Perform final taste tests for salt, and remove the bay leaf. And now it’s done! 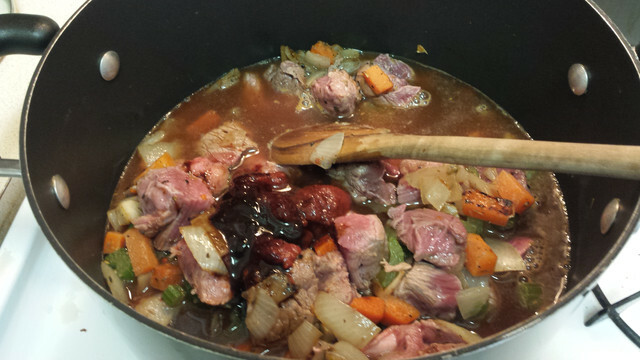 This recipe is incredibly hearty and delicious. I’d honestly recommend doubling the ingredients to make an extra large batch so that you have leftovers. I have a hunch this would freeze well too, so you can have leftovers forever, if you wanted. I served mine up to my friend and roommate, and had to fight my roommate off the leftovers so that I could pack them up for lunch. 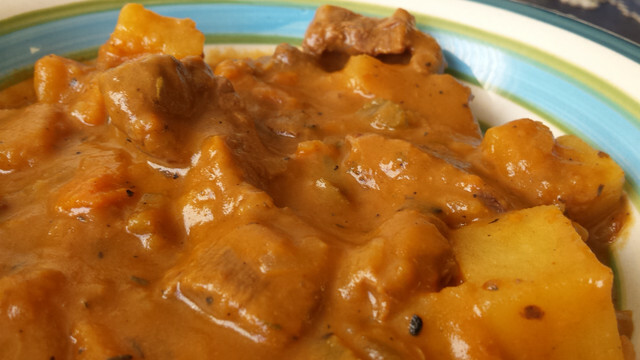 According to her, a 9-star Food critic, this dish was “Hella good” and “10/10, would eat again.” I really think this stew would be even better in a breadbowl, or with a slice of bread to mop up the delicious sauce, at the very least. 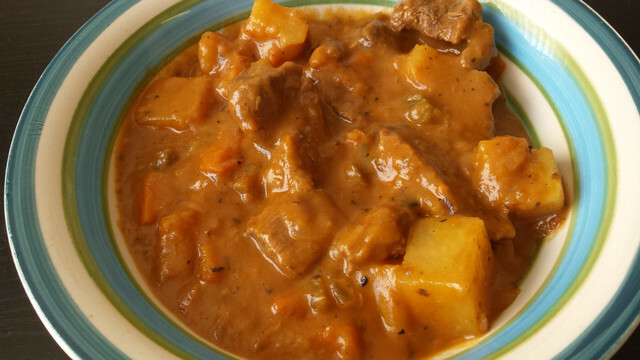 Ed sure knew what he was talking about when he waxed poetic about the merits of beef stew.